This wireless USB adapter is easy to use and easy to install. If you have been tired of dealing with all those messy wires to connect a laptop or PC to officeor home network, this wireless adapter is an ideal and extremely convenient access solution for wireless internet connection. Support Operating System:Windows 2000, XP, Vista, Win7, Linux, MAC. 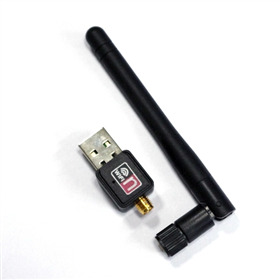 1 x USB Wireless LAN Adapter . 1 x Software Driver .